La newyorkese Mode Records recupera tre storici lavori di Joan La Barbara concepiti tra il 1976 e il 1981 attorno a concetti di spazializzazione e di scultura sonora, rivisti e corretti (Autumn Signal e As Lightning Comes In Flashes) o finora inediti (Cyclone): The Immersive Early Music of Joan La Barbara, disponibile in regolare cd e in Blu-ray ad alta definizione. 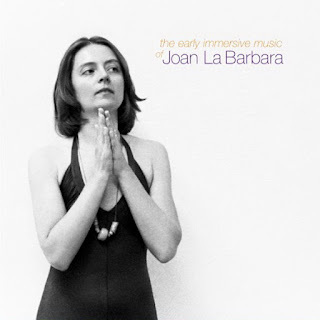 Over the past four decades, Joan La Barbara has created a number of multi-channel works that were designed to be heard in quadraphonic sound and other unusual spatial arrangements of speakers. These works were initially performed in concert using multiple speakers and various systems designed to allow movement of sound from speaker to speaker. To have these vintage works available in a contemporary format is to bring back to life works that have been nearly lost for several decades. For the surround sound format to be used for sonic art works is to enhance the viability of this medium as well as to preserve, in their original conceptual form, works that were created to immerse the audience in the artist’s sonic vision.